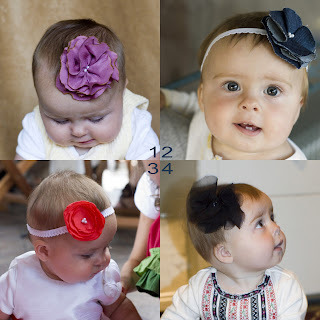 After I had two boys, I was thrilled to have a girl whom I could dress up in a different way. I have made some of my own very simple creations for my daughter using scraps of fabric. All of the bows in this collage were re-purposed scraps from (1) an old blouse, (2) an old pair of jeans, (3) leftover scraps from sewing a bridesmaid dress, (4) lining of an old skirt. None of the clothes I cut up were in a condition to give away because they were too worn or stained, so I was happy to be able to recycle the fabric, save money, and make fun accessories for my little baby girl. Depending on your style, you can easily find inspirations online for creating your own fabric flowers which you can put on clips or headbands. This post has a round-up of some great online tutorials for fabric flowers. Not being an expert sewer, I personally like doing a simple box-fold type flower or layering petals with singed edges. I invested in one small bag of seed pearls at the fabric store, some plain hair clips (Clips Metal Single Prong 80 Count ), and some lingerie elastic to attach to my completed fabric scrap flowers. *On a separate note, another thing I have done with scraps from old clothes is create a Montessori fabric matching game. I cut up different fabrics--having two of each type of fabric. Then, I blindfold my child and have him feel the fabric to find the matches. I start by handing him two pieces at a time and asking him if they are the same or different. I do this several times until he can confidently answer each time. Then, he progresses to having the whole set of fabric and pairing the matches on his own. Fabric matching is an excellent sensory activity that my boys love to do.